The Lagotto Romagnolo does not lose hair. His cloak is one of the strengths of this breed. 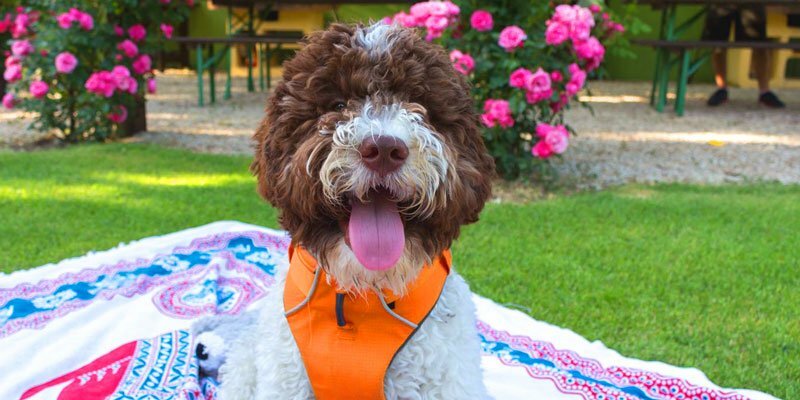 Who has a Lagotto Romagnolo does not find annoying hairs around the house, couch or car. Who has a Lagotto Romagnolo for truffles, with the management of shearing will have a dog suitable for all seasons. The Lagotto Romagnolo should not be brushed for any reason. Using combs with steel teeth not too sparse. The breed standard provides a curly coat and a rustic look. The combing is targeted to keeping the hair clean and free of knots. Behind the ears and under the armpits are the points where the hair felts more easily. Grooming should never be excessive. We must not confuse our Lagotto Romagnolo with a Poodle, I want not offend the owners of the Poodles. A small video that helps you understand how the main grooming operations take place. 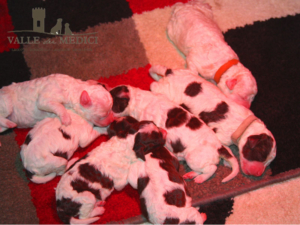 Operations we will however go below to describe specifically for the Lagotto Romagnolo. With the arrival of the heat and to renew the mantle an annual shearing it is necessary. The period generally coincides with the arrival of the heat may-June. With a short hair the Lagotto can walk and run for meadows without filling with annoying and dangerous pellets of grasses. The fur on the head and on the legs grows slower. In these two areas the hair is kept slightly longer. The tools needed for the management of the mantle are the shearer, the scissors and a comb. The shearer must necessarily be professional otherwise after three shearing we have to throw it and we will never do a good job. The blades must be well oiled and usually 3mm high. An alternative it is to turn to dog grooming. Only a recommendation: give him a picture of the head lagotto, too often Lagotto exit as Poodles, but the Lagotto is another dog breed . The number of annual shearing is limited then it’snt so expensive. The scissors can also be common scissors if we have no intentions to participate in shows. Sometimes it may be necessary to make small finishes. The grooming from shows is very complex and not all groomer know how to groom a Lagotto Romagnolo for show. The comb as mentioned is a teeth not too sparse and steel. The purpose is to keep the hair clean and the hedgehog in order without knots. If we exclude particular situations that have dirtied our dog indecently, the complete bath can be limited to once for year. When it must be evalueted according to the season. The conditions of the mantle particularly full of knots can induce us to an extraordinary bath. A conditioner can help to better untangle the knots. Then we can proceed with a slight lowering of the length of the hair. Due to a different PH of the pet’s skin compared to humans, its should be used Dog products. 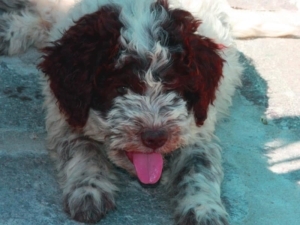 The fur of the Lagotto Romagnolo is an important protection against water and cold. With a thick coat, the lagotto enters in the stain to recover the most cramped truffles and easily exceeds the shrubs in the woods. Usually we proceed with a couple of shearing for year. The first with the start of the warm season for the renewal of the mantle. It is then repeated in order to go in search of truffles in the summer. The short hair , let feel less the heat, its also are not filled with annoying and dangerous grasses and other seeds of the season. In Tuscany from September begins the search for the white truffle. The arrival of autumn open all the regions to the white truffle, the Magnatum Pico. To be ready, the coat of the lagotto must be left growand not sheared for a couple of months. Conversely we will see our lagotto stop in front of the barrier of stain which typically protects the terrain where is the white truffle. When it is the opportune time to have the first snip to the fur of the puppy of Lagotto it’s a controversial issue. Somebady believes grooming too early it can make the hedgehog lose. Others think a nice grooming strengthens the fur. I do not think the hedgehog depends on when we cut for the first time the fur of our puppy. It depends on nature and how we will keep it in order with constancy. Around three months old we can strìart to shorten the length of the mantle. We remove the necessarily felted hair that the puppy has been wearing from birth. How much shortening depends substantially from circumstances. The outside temperature, the climate and where the puppy spends most of the time are the elements to be assessed to decide how much to shorten the length of the mantle. He lives in the house or in the garden..
Grooming our Lagotto Romagnolo puppy with constancy accustomed him to this moment. Starting soonly he will get used to being handled being quiet. The control and cleaning of the ears of Lagotto Romagnolo are operations to always keep in mind. The curly hair around the ear can be a vehicle of infections and dirt responsible of otitis. The hair may form progressing towards the ear canal and be a vehicle for external bodies such as dangerous grass which can also cause serious damage. The hair that forms on the ear-piece and near the ear canal must be removed. The hair on the ear-piece and close to the ear canal must be removed. In the first few times the Lagotto will feel this practice strange and not be so available. Then, he will get used to it and will see benefits. Depending on the subjects we will also notice his inclination to get cleaned. In any case the cleaning of the ears does not cause pain. There are specific products for ear cleaning. Once product has been introduced into the auditory duct it must be massaged and then dried with cotton. Internal cleaning with detergents is not a substitute for the removal of the hair which is still necessary.